It's no secret that I love Halloween. I just do. It's the best. 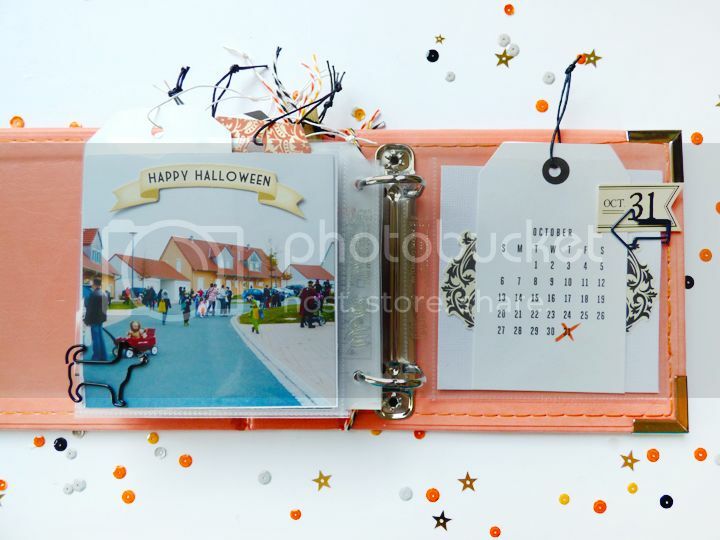 I've had photos printed from our October 2014 shenanigans and an orange mini album chosen since last year, but since this was a "just for fun" project it's been sitting on the backburner since... well, October of 2014. Almost a year later I decided to take a bit of Halloween stuff with me on the cruise and over the course of a couple days I got it finished! While Jane was napping and Fox was playing in the kids room I would take my scrap stuff to the "book nook" and set up shop on a table. It was fun having people hover over me and ask what I was doing. 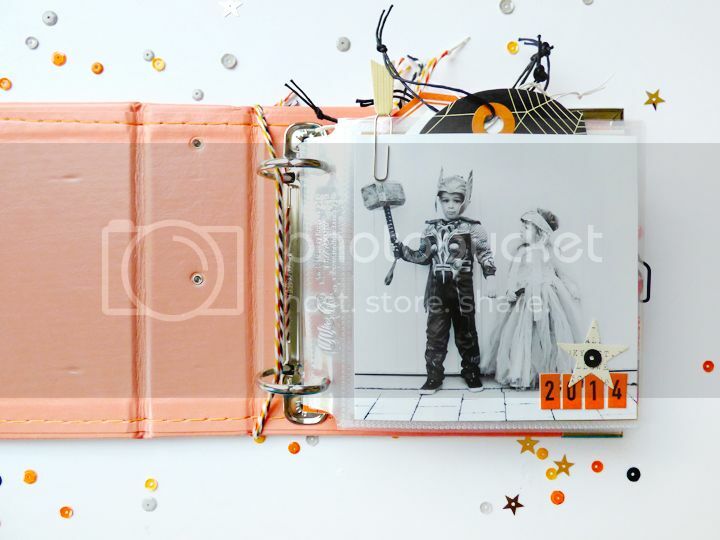 Scrapbooking is so foreign to some people, it's quite funny! And I must add, by no means do I consider myself a "mini album maker". 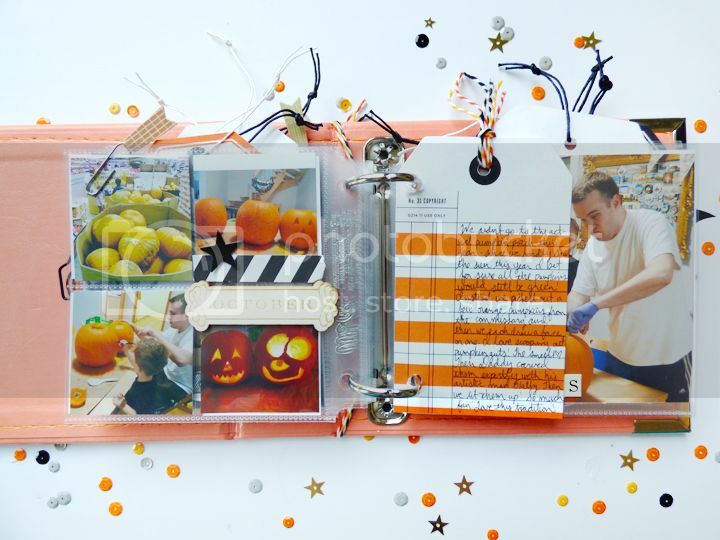 Traditional scrapbooking pages are what I love. But oh my goodness it was FUN and great creative therapy to try something outside the norm! 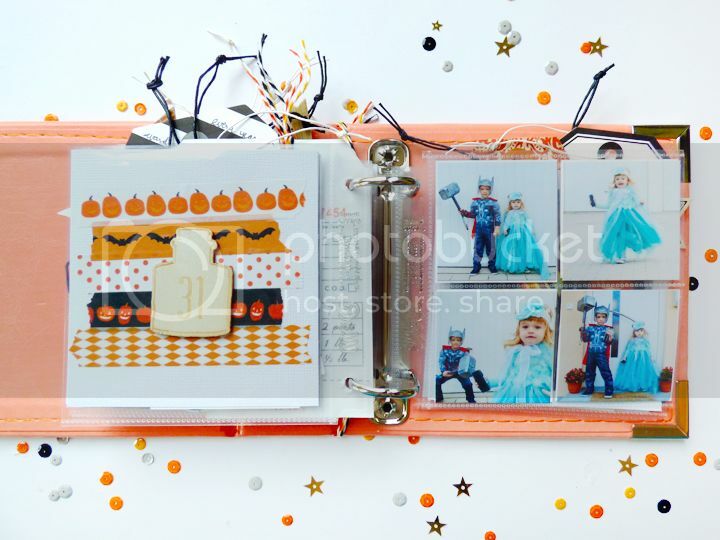 The We R Memory Keepers mini albums with square and mini pocket pages are SO PERFECT for instagram photos! Once I popped the pictures into the sleeves, the rest of the album came together in a snap. 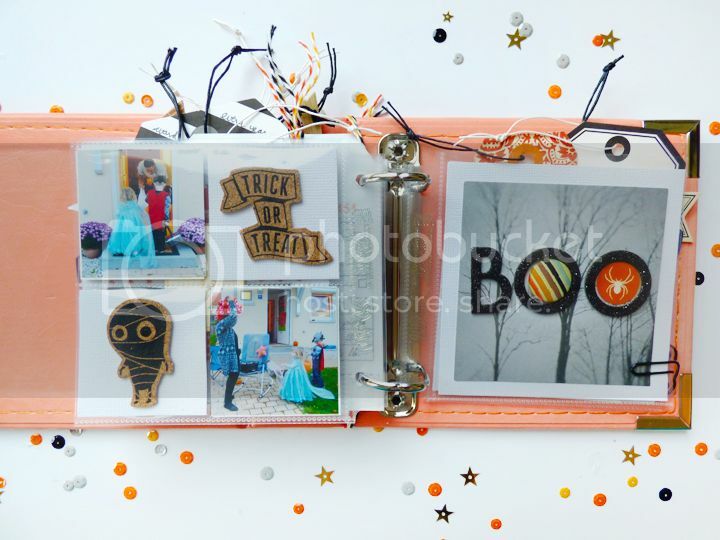 The journaling for each spread is written on a tag and tucked into the sleeves. One of my favorite stories that I couldn't wait to document is written down on a tag. On the first day of October we decorated to the nines. We die cut pumpkins, painted paper plates like candy corn, the whole enchilada. Then Fox turned to me and asked, "Mom, why are we having so much fun?" Ha! Because I love Halloween, that's why! 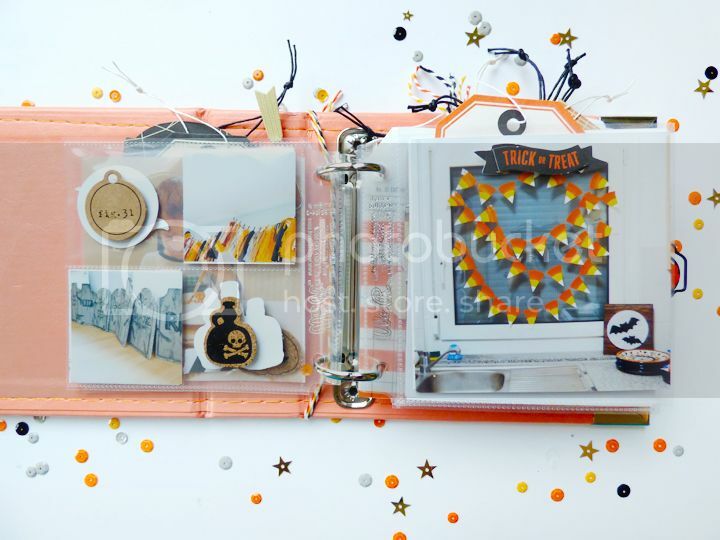 I loved combining all sorts of Halloween lines and collections to make this all-around festive album. 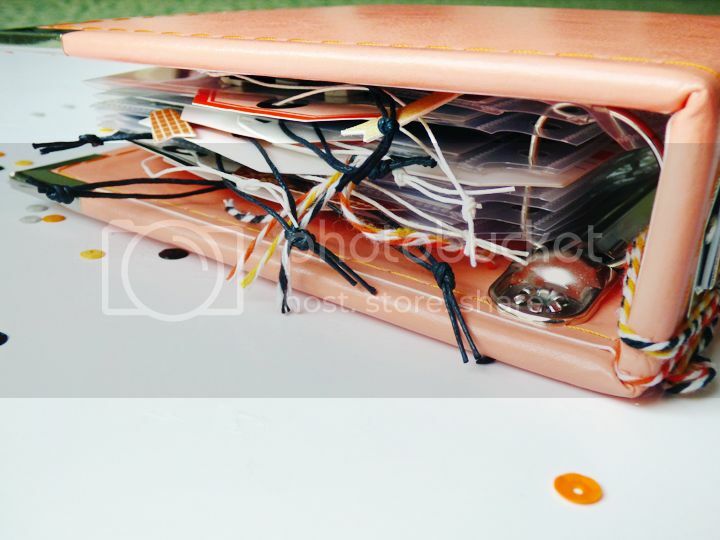 Sometimes I adhered the embellishments on top of the page protectors instead of inside. I slid on paper clips here and there to make turing the pages more interesting. I used thick embellishments that I probably wouldn't use on traditional layouts since there was plenty of room for them in the mini. 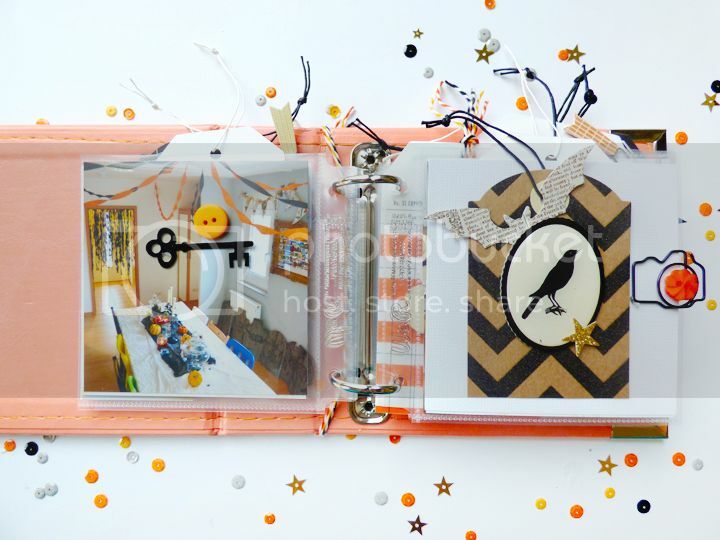 I glued two tags together and wrapped Halloween-colored baker's twine through the top as a custom journaling insert. It was easy to add into the album after punching two holes. Got lots of white space on a photo? That's a perfect place for a caption and/or embellishment! Layer strips of washi tape for a custom background! 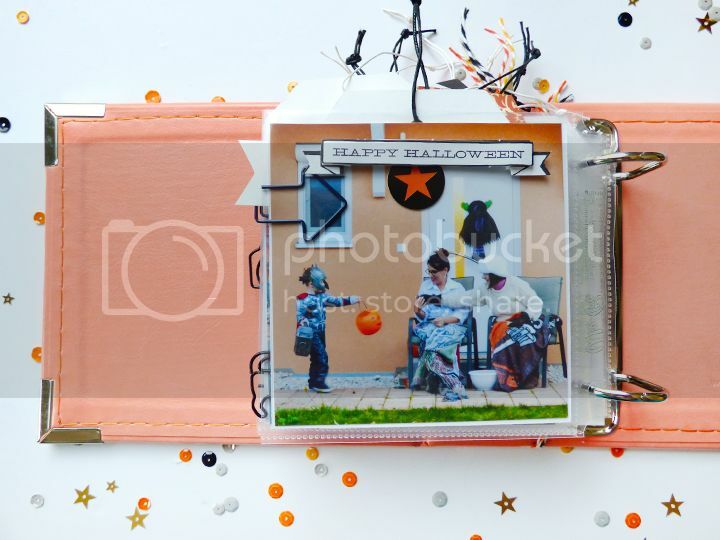 I loved placing two photos and two embellishments in the 4-pocket page protectors. All of the tags with strings give the album some bulk and whimsy. I put one of my favorite Halloween photos as the last page - my expert trick-or-treater. 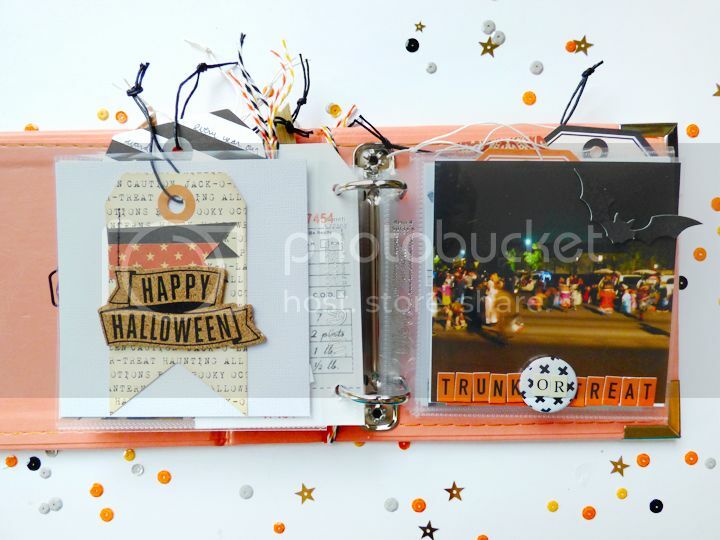 I wrapped baker's twine around the album and tied it in a bow and used "OCT 14" alpha stickers on the bookplate for the title. Moral of the story: consider me hooked on this style of mini album! 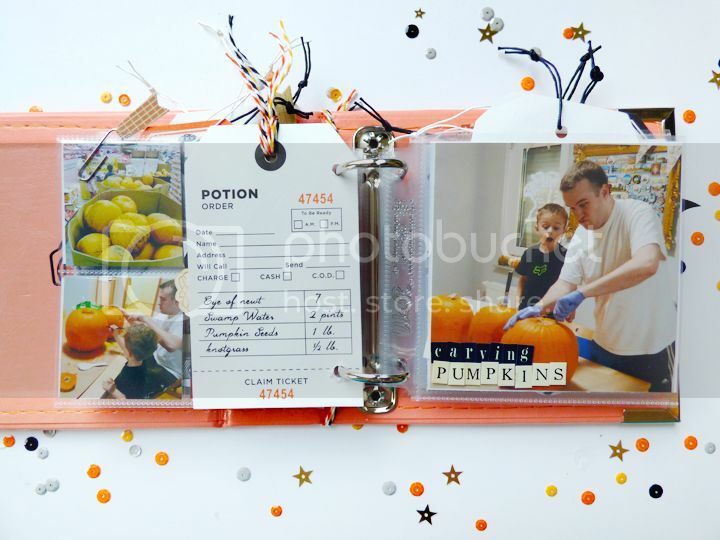 I'd love to make one for each holiday and adventure we go on!! This is AWESOME!! LOVING all the photos and the tags you added!!!! 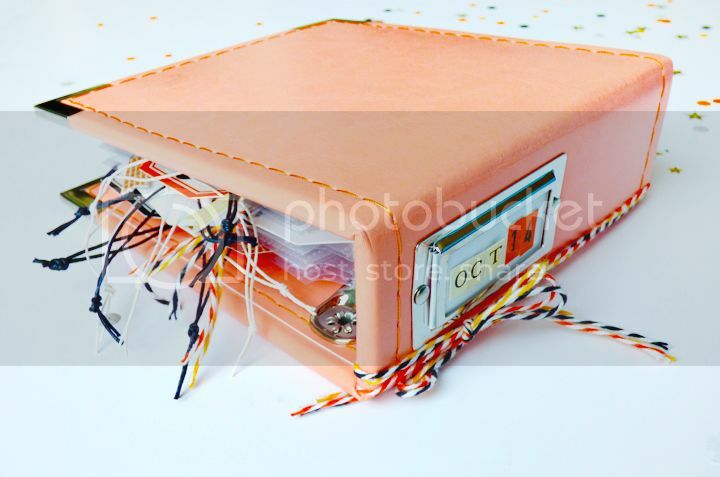 The One with Bookbinding at Scrappies Recap! The One with Teaching Near Bamberg, Germany! 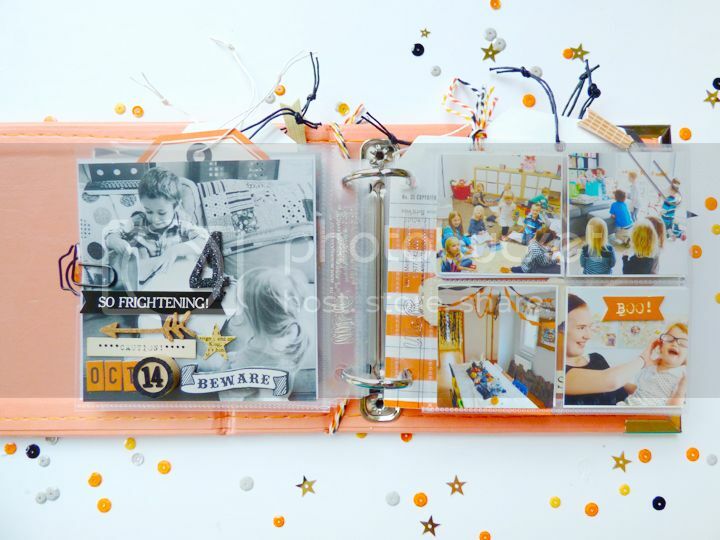 The One with the Flat Back Case Binding Class! 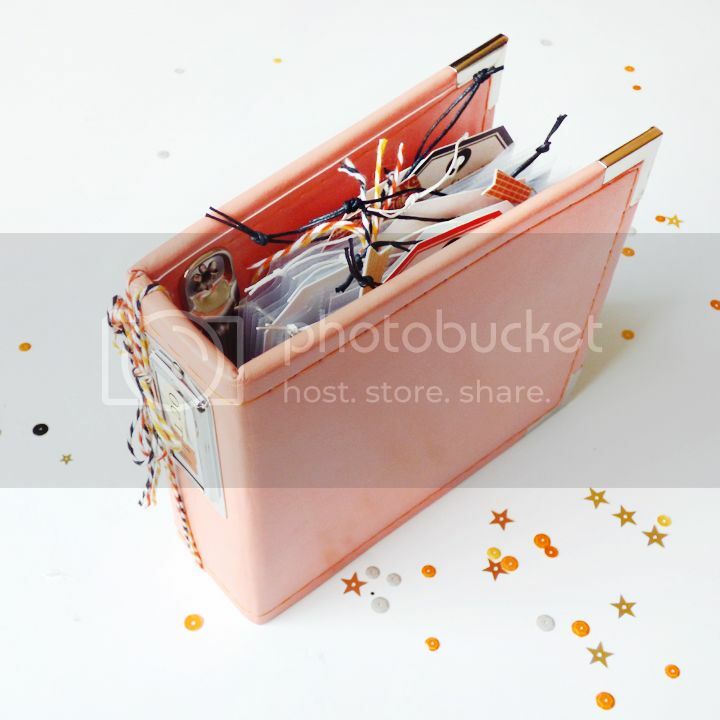 The One with Creative Options: Back to School!